My goodness, time is flying by. Before you know it, it will be Halloween, then Thanksgiving will sneak in and . . . I don't even want to think how fast the C word will get here. Work is taking up a lot of my time, but I'm still spending a lot of my home time designing. In fact, I am experimenting with some new things. 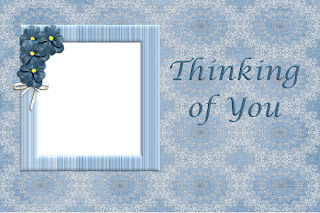 One of the new things is printable photo greeting cards. I would like you to help me decide whether to pursue this venue, so I am offering one as a freebie today. Click on the preview and you can download it. Only the front is shown. The inside of the card is blank so you can write a message. The file is png, at 300 dpi. Please, if you download it, let me know what you think of the finished product.